Tom Patterson created this map as an experiment to showcase Terrain Texture Shader. This new software detects small variations in a digital elevation model and renders them as rough textures resembling rocks. The Canyonlands map combines these rock textures, applied only to the steepest slopes in Adobe Photoshop, with traditional shaded relief. The arid land colors derive from an aerial photograph mosaic in the background. As a final touch, the muddy and otherwise invisible Colorado and Green rivers were tinted blue to make them more noticeable and attractive. 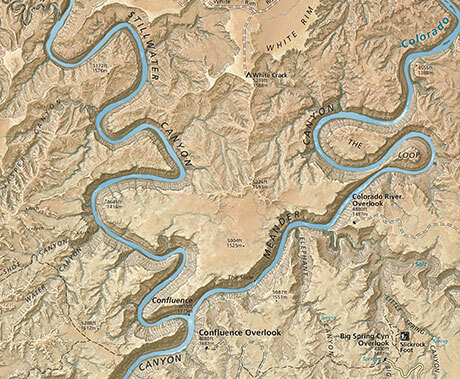 The Heart of Canyonlands (detail) by Tom Patterson, published at the Atlas of Design by NACIS, 2014. MapCarte 282/365: The Heart of Canyonlands by Tom Patterson, 2014. Blog entry by Kenneth Field, 2014. Mountain Cartography Workshop Maps by Tom Patterson, 2014.